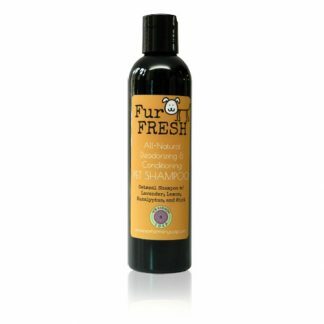 View cart “FurFresh Natural Pet Deodorizer” has been added to your cart. In between shampoos your pet may need a little odor control assistance. That’s why we invented FurFresh™ All-Natural Deodorizer Spray featuring a refreshing blend of lemon, cedar, rosemary, and tea tree essential oils. Anytime your pet needs a dose of fresh just lift fur with a comb or brush and spray. There’s also a bit of vegetable glycerin in the formula to add some moisturizing relief to dry, flaky skin so your pooch will chill out with the excessive scratching. Scent Description: Blend of Lemon, Cedar, Rosemary, and Tea Tree essential oils.